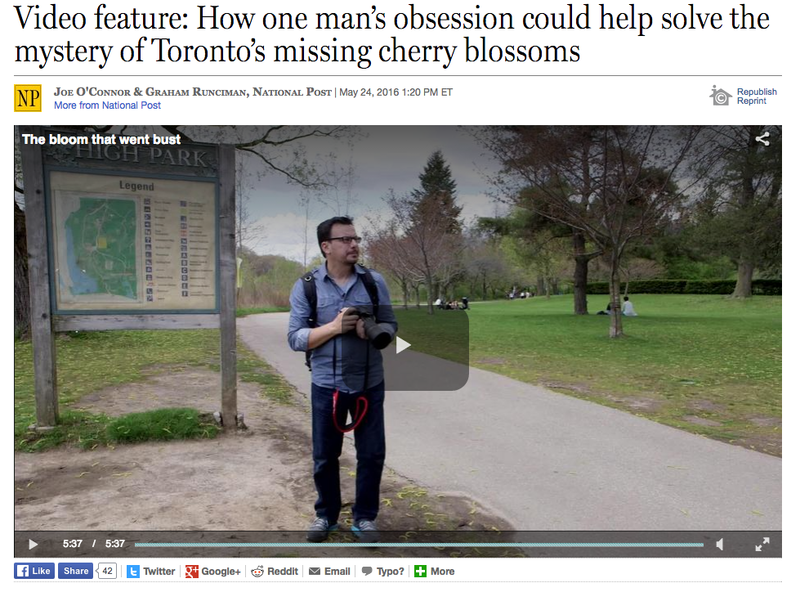 Video: National Post interviews Sakura Steve about the lack of cherry blossoms in High Park this year and have posted an article with a 5 min video giving many the first chance to meet the man behind the Sakura in High Park website. The idea of creating the video was first brought to me by National Post writer/columnist Joe O'Connor and after piquing my interest we picked May 13th as the day to go out and film with Graham Runciman (videographer). It was a perfect sunny spring afternoon in the park and both Joe and Graham did an excellent job in helping me feel comfortable in telling my story and share some of my thoughts into the lack of any cherry blossom this year. There is even a segment learning more about the Japanese tradition behind the sakura cherry blossoms from a representative of the Consulate General of Japan in Toronto. Overall I think they put together an excellent video and had a lot of fun that afternoon - thank you Joe and Graham!